Two-sided Radiant Barrier is made of two layers of aluminum foil laminated to a layer of woven polyethylene. 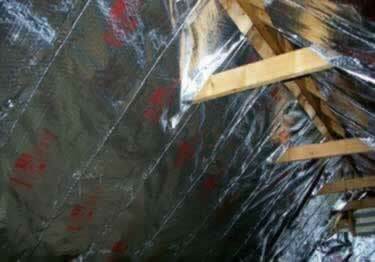 This heavy duty radiant barrier has superior tear resistance. It is available with perforations so it can be used as a vapor retarder or can allow vapor transmission. Great for reducing heat in the summer and retaining heat in the winter! One of a kind multi-layer Radiant Barrier 20 year warranty. How thick is the material? Can it be installed on the attic floor or does it have to be on the roof rafters?